New technology allows your surgeon to use individualized, gender-specific prosthetics. This means that your new joint can be customized to you for the best possible fit, which increases the life of your implant. Advanced technology, coordinated care, and customized rehabilitation - so that you can get back on your feet faster. At Middlesex Health's Center for Joint Replacement & Spine Surgery, we are committed to providing the highest quality care for your knees. Knee injuries can happen in an instant or be the result of a chronic condition like arthritis. In either case, our expert orthopedic team - which includes surgeons, a Nurse Navigator, physical therapists, and more - is committed to guiding you through the diagnostic, treatment, and recovery process. Knee replacement surgery involves the removal of the heads of the thigh bone (femur) and the leg bone (tibia). Both ends of the bones are reshaped to accept customized fittings. The new fittings are put in place and a small plastic liner is inserted between the metal pieces to keep the joint moving smoothly. A knee cap liner is then inserted to prevent any friction on the new joint. Visit our online Learning Center for more information on knee replacement surgery. Modern, minimally invasive surgical techniques allow orthopedic surgeons to perform knee replacement with greater precision and fewer complications. In the past, the traditional partial placement approach to knee replacement left considerable room for error; by using the latest methods, our expert physicians are setting you up for the most successful recovery possible. The NAVIO™ Surgical System is a robotics-assisted knee surgery platform that adds an extra layer of pre-surgical planning and improved precision for partial and total knee replacement procedures. Each patient's knee replacement surgery is unique to their own anatomy and implant. The NAVIO™ Surgical System allows your surgeon to ensure that the new joint is placed correctly. This is important because accurate placement lengthens the life of your implant. Surgical techniques have evolved considerably since the earliest knee implant procedures were performed in 1968. These procedures relied on manual guides, external pins and cutting jigs to remove damaged bone and place the prosthetic implant. Eventually, more advanced implant positioning techniques were introduced. The new methods involved drilling long rods into the central canal of the femur (thigh bone). These rods provided an attachment point for surgical cutting guides. More recent improvements introduced CT (computerized tomography) scan/MRI image guidance to create an individualized computer-generated surgical plan for each patient. The NAVIO™ Surgical System, a robotics-assisted platform that uses CT-free technology for precise implant sizing and positioning without the need for rods, is the latest innovation in the field of knee replacement. 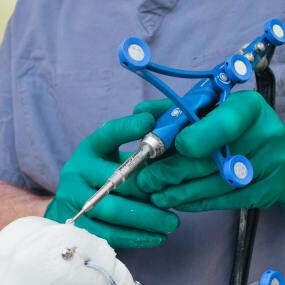 It can be used for either a partial or total knee replacement procedure. The NAVIO™ system offers two important benefits for people undergoing a knee replacement procedure. Limited Radiation Exposure: NAVIO™ allows your surgeon create a highly individualized plan that is specific to the unique shape and motion of your knee. Traditional planning may require CT scans, a series of images similar to x-rays that shows cross-sections of your knee. While other robotic-assisted platforms require CT scans, the NAVIO™ system works without them, meaning you are not exposed to the potentially harmful radiation experienced with this type of imaging. Robotic Assistance: Robotic technology is designed to help your surgeon and may result in more accuracy, giving you better long-term outcomes. In partial knee replacement, the supporting tissue and ligaments that help stabilize your knee are saved - only the damaged portion of the knee is replaced. This means that healthy cartilage and bone remain intact to help your knee joint move smoothly with the prosthetic implant. Patients with osteoarthritis in only one area of their knee may be candidates for partial knee replacement. Patients who undergo partial knee replacement often report a 'more normal' feeling knee, less pain, and quicker rehabilitation. In total knee replacement, the entire knee joint is replaced with a prosthetic implant designed to replicate the shape, motion and stability of your natural knee joint. Total knee replacement is one of the most common procedures performed in all of medicine, with over 600,000 performed in the U.S. every year. Ninety percent of people who receive a total knee replacement experience a dramatic decrease in knee pain, and an improvement in their ability to perform daily activities. Individual results may vary. There are risks associated with any surgical procedure including NAVIO-enabled Knee Replacement. NAVIO™ is not for everyone. Children, pregnant women, patients who have mental or neuromuscular disorders that do not allow control of the knee joint, and morbidly obese patients and patients contraindicated for UKR, PFA and TKA should not undergo a NAVIO™ procedure. Consult your physician for details to determine if NAVIO™ is right for you. 1. Collier, Matthew, et al., "Patient, Implant, and Alignment Factors Associated With Revision of Medial Compartment Unicondylar Arthroplasty. ", Jour of Arthro, Vol 21 No 6, Suppl. 2, 2006. 3. Hall et al., "Unicompartmental Knee Arthroplasty (Alias Uni-Knee): An Overview with Nursing Implications," Orthopaedic Nursing, 2004; 23(3): 163-171.